The bulls were back in action at the bourses today amidst reports of reconciliation between the Ambani brothers causing the Sensex to breach past a record 6200 points. Riding on the back of a broad-based rally, the Sensex touched its highest at 6249 points during intra-day trades before closing lower at 6234 points. New Delhi: Finance Minister P. Chidambaram today said he would be happy if the current bullish trends in the stock markets are driven primarily by the fundamentals of the economy. Reliance Energy Ltd today reposed faith in the present management led by CMD Anil Ambani while conceding ground to the parent company, Reliance Industries Ltd headed by CMD and elder brother Mukesh, by deciding to henceforth consult RIL, on its future prospects. The ownership feud in the Reliance Group had its fallout on power sector reforms in Uttar Pradesh as the state government today extended the date for the acceptance of bids for the privatisation of five power distribution companies by another 15 days. Kolkata: Infocom 2004, the biggest annual extravaganza for the ICT industry in the Eastern region, will kick off tomorrow with the inauguration by Reliance Industries Chairman Mukesh Ambani. Infocom 2004, jointly organised by Nasscom and Businessworld, will be held in the city from December 1 to 5. 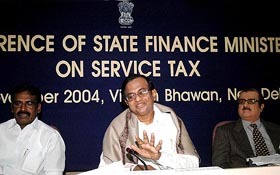 The states today demanded that service tax collections be shared equally between the Centre and the states on a 50:50 basis even as Finance Minister P. Chidambaram exuded confidence that a consensus will be arrived at. The acquisition of US-based Cymbal Corporation, a telecom service provider IT company, by Patni Computer Systems, India’s sixth largest IT services company, for $ 68 million earlier this month made an important economic news for more than one reasons. While it was among the largest such acquisitions, the news holds immense significance, particularly for Indians as the man behind Cymbal Corporation hails from Ludhiana. The government could allow the private sector domestic airlines to fly to more foreign destinations in the coming weeks, with the decision expected during the winter session of Parliament beginning tomorrow. Union Minister of Commerce & Industry Kamal Nath has convened a meeting here on December 11 with all export promotion councils, commodity boards and other concerned bodies to discuss ways and means to push India’s exports to a level of $ 75 billion during the current financial year 2004-05. A pavilion of the Gujarat state, prepared on a theme by Gujarat Narmada Valley Fertilisers Company Ltd. (GNFC), Bharuch, has won the first prize in the India International Trade Fair held from November 14 to 27 at Pragati Maidan, New Delhi. Spice Telecom has introduced a service whereby other Spice subscribers can be traced without ringing a bell. Talking to mediapersons here today, the DGM (Marketing), Mr Mukul Khanna said Spice Locator, a first of its kind location based service will enable its subscribers to know the location (or nearest tower) of other subscribers in Punjab. The bulls were back in action at the bourses today amidst reports of reconciliation between the Ambani brothers causing the Sensex to breach past a record 6200 points. Riding on the back of a broad-based rally, the Sensex touched its highest at 6249 points during intra-day trades before closing lower at 6234 points. Though the Sensex looked like breaching the highest intra-day point touched in January 9 this year, it slipped down on profit booking on some counters. Today's closing saw the BSE sensitive index at 6,234, a gain of nearly 76 points. The Nifty also closed at 1,958 points. Despite positive signals emanating from Reliance, all the scrips from the Ambani stable made only marginal gains. REL closed marginally higher while Reliance Industries gained just 1 per cent over the previous close to touch Rs 516. The counter of Reliance Capital also attracted strong buying with the scrip posting gains of over 1 per cent. Market analysts attributed today's bull run continued inflows from foreign institutional investors. The rally is being led by FIIs, who have pumped in $1.3 billion so far in November and a record $6.9 billion during this year. The major gainers today were Infosys, Bharti, Hero Honda, HLL, L&T and Ranbaxy. However, the momentum in banking stocks was mixed as profit taking dragged down several scrips in the latter half of the trading day. Expectations of higher interest rates helped boost sentiments. Punjab National Bank was the biggest gainer closing 5 per cent higher. Federal Bank, the Oriental Bank of Commerce, Vijaya Bank, Andhra Bank and the Bank of Baroda posted gains of over 2 per cent each. However, the Bank of India, Bank of Punjab and IndusInd Bank lost over 2 per cent each. Though mid-cap tech scrips took a beating, blue-chip counters made health gains. Infosys surged over two per cent on the back of seven per cent ADR gains. Satyam and Wipro closed with marginal gains. I-flex Solutions also closed 3 per cent higher. However, oil PSUs witnessed profit booking. BPCL shed over 4 per cent while HPCL, IOC and Bongaigaon Refinery lost over 2 per cent each. "I don't react. As long as the Sensex is driven by the fundamentals of the economy, I am very happy," he said. Reliance Energy Ltd (REL) today reposed faith in the present management led by CMD Anil Ambani while conceding ground to the parent company, Reliance Industries Ltd headed by CMD and elder brother Mukesh, by deciding to henceforth consult RIL, on its future prospects. The Board of Directors of Reliance Energy Ltd (REL) today asked six of its members who quit last week to reconsider their decisions. According to a statement by the REL, the board which met for three hours today "asked the directors to reconsider resignations and reposed full trust and confidence in the existing management of the company". Till then, the six directors will continue to function as before, REL said. REL’s board of directors also decided to separately consult the board of Reliance Industries Ltd, the principal shareholder in the energy utility "on several matters concerning the future prospects of the company and related issues," the statement said. Sources say, the resignations of the six REL board members may be considered after consultations with RIL are complete. The battle between Reliance Industries Group Chairman Mukesh Ambani and Vice-Chairman Anil Ambani took another turn today with a board member openly criticising them. Y. P. Trivedi, a veteran Reliance hand and close associate of founder Dhirubhai Ambani, said the quarrel between the two brothers was a battle of egos. However, he expressed the hope that the differences between Mukesh and Anil Ambani will be resolved soon. Earlier, the UP Power Corporation Limited (UPPCL) had fixed December 1, 2004, as the last date for accepting bids through an advertisement on November 1. Reliance Energy Ltd, headed by Chairman and MD Anil Ambani, had purchased bid documents for acquiring majority equity stake in the five electricity distribution companies (discoms) early this month. The UPPCL was already in selecting mode between eight bidders for the Anpara-C thermal power project, which was completed on November 1. According to power department sources, the date for submission of bids for five discoms were extended to enable “quality private players” get opportunity for bidding. Sources said 15 companies have already submitted their Request for Qualification (RFQ) and few more could be expected to do so given the fact the last date of submission of the RFQ have been extended till December 15. Kolkata: Infocom 2004, the biggest annual extravaganza for the ICT industry in the Eastern region, will kick off tomorrow with the inauguration by Reliance Industries Chairman Mukesh Ambani. Infocom 2004, jointly organised by Nasscom and Businessworld, will be held in the city from December 1 to 5. The theme this year is ‘Harnessing ICT for global competitiveness’. "A variety of views were expressed. We will examine the views carefully... I have no doubt, we will reach a consensus," Mr Chidambaram said after the meeting with state Finance Ministers on the issue of service tax. The Finance Minister said that some of the ideas suggested by the state government were "very interesting" and several important issues were highlighted. "It's an encouraging process," he said. Under the existing formula, 29.5 per cent of total taxes under the divisible central pool is received by states in accordance with the devolution formula worked out by the Eleventh Finance Commission. "All states have said that Central Government should collect service tax but it should be shared on 50:50 basis," West Bengal Finance Minister Asim Dasgupta said. While the 95th Constitutional Amendment Bill allows the Union Government to levy service tax, no decision has been taken on how to distribute the Bill among the states and the Central Government. It has been pointed out by some states that there were certain services for which states were already charging sales tax, but the introduction of the service tax these fall under the Central list. This would adversely affect the revenue of the states. The enterprising 36-year-old Neeraj Gupta would be among very few to attain such meteoric heights, merely within a span of six years of starting a company. After completing his schooling from this city and later engineering (electronics and communication), he went for higher studies to the USA in 1989. After working for a couple of companies, including Lucent and Octel, Neeraj started his own company, Cymbal, along with Amitabh Nagpal, who too graduated from PEC, Chandigarh in 1998. Then on there was no looking behind. In June 2004 Cymbal recorded $ 32 million of revenue. And the company had on its list names like Virgin Mobile, Hutchison Telecom and Comcast, telecom service providers that are among the largest in the world, apart from an employee and consultant base of over 500. “I believe it was our decision to focus on one segment that helped us perform well,” a modest Neeraj gushed. Talking to The Tribune, Neeraj, who was here to attend a family function, said he was more than happy to now be a part of one of India’s largest IT services company. According to him, Indians not only have the expertise they are quite intelligent to tap business opportunities and “after identifying the challenges the need is to provide solutions to those segments. These segments could be small but it is this focus that helped our company grow and there are many more segments that are yet to be tapped,” he feels. At macro level, he says, opportunities lie in industries like life cycles (pharma) with majority population in the Western countries ageing. Outsourcing, he opines, still holds tremendous potential. Moreover, when it comes to designing and engineering skills, given the fact that a lot of manufacturing takes place in our country, India can emerge as a winner. Civil Aviation Secretary Ajay Prasad said the decision to allow the domestic private airlines to fly abroad could come during the winter session. While the government's nod is still awaited, Mr Prasad said the Civil Aviation Ministry favours allowing government-owned domestic carrier Indian Airlines (IA) as well as private carriers to fly abroad and supplement flag carrier Air-India's operations. At present, Jet Airways and Air Sahara have been allowed to fly to destinations in member countries of the South Asian Association for Regional Cooperation (Saarc), including Nepal and Sri Lanka. The Malaysia Airlines today announced the introduction of five additional direct flights from India to Malaysia, adding over 1800 seats on the airline per week. A release issued by Tourism Malaysia said the additional flights would start from tomorrow for the Mumbai, Bangalore and Hyderabad sectors and from December 16, it will connect Ahmedabad as well with Kuala Lumpur. The Mumbai-Kuala Lumpur route will now operate a daily flight. Union Minister of Commerce & Industry Kamal Nath has convened a meeting here on December 11 with all export promotion councils (EPCs), commodity boards and other concerned bodies to discuss ways and means to push India’s exports to a level of $ 75 billion during the current financial year 2004-05. The purpose of the meeting is essentially to review the country’s export performance in the light of the new Foreign Trade Policy (2004-09). An export target of 16 per cent growth corresponding to a level of $ 73.4 billion has been fixed for the year 2004-05, which is higher than the target for the last two years of 12 per cent. This will help exports to reach a level of $ 150 billion in 2009-10. According to the latest available aggregate data, India’s exports during the first seven months of current financial year 2004-05(April-October) have crossed US $ 40 billion. India’s exports during April-October 2004-05 are valued at $ 40291.08 million ($ 40.02 billion), which is 23.73 per cent higher than the level of $ 32564.32 million ($ 32.5 billion) during April-October 2003-04. A pavilion of the Gujarat state, prepared on a theme by Gujarat Narmada Valley Fertilisers Company Ltd. (GNFC), Bharuch, has won the first prize in the India International Trade Fair (IITF) held from November 14 to 27 at Pragati Maidan, New Delhi. The Government of Gujarat had entrusted the responsibility to GNFC to prepare a theme pavilion on the subjects of agriculture and IT. The Punjab Pavilion has received silver trophy for the 2nd best display among the State Pavilions says an official press note. Over 30 state pavilions competed for the awards. However, this service is permission based and only when the subscriber permits his location can be given out to the person requesting for it. Airtel today launched ‘Airtel Blast Packs’ offering a host of value-added services for its customers in Punjab. The innovative VAS cards of various denominations now offer services like SMS, ringtones, MMS, internet etc at rates that are up to 50 per cent less than the normal rates. Mr Mandeep Bhatia, Vice-President, Marketing and Sales, said the Airtel Blast SMS pack will now offer SMS for as low as 16 paise instead of Re 1.